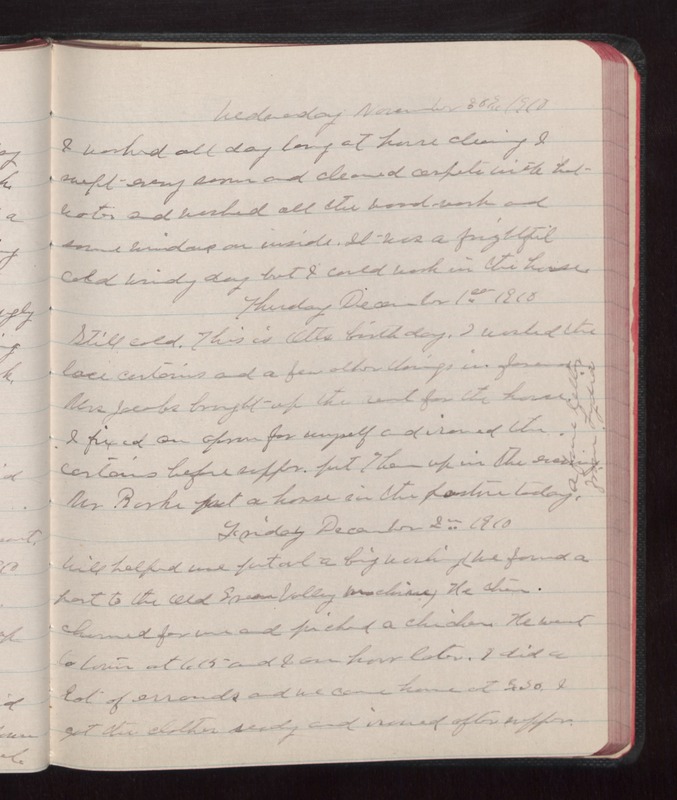 Wednesday November 30 1910 I worked all day long at house cleaning I swept every [room?] and cleaned carpets with hot water and washed all the wood-work and some windows on the inside. It was a frightful cold windy day but I could work in the house. Thursday December 1st 1910 Still cold. This is Otts birth day. I washed the lace curtains and a few other things in the forenoon. Mrs Jacobs brought up the rent for the house. I fixed an apron for myself and ironed the curtains before supper, put them up in the evening. Mr [Burke?] put a horse in the pasture today. Friday December 2 1910 Will helped me put out a big washing we found a part to the old [Green?] Valley [machinery?] He then churned for me and [picked?] a chicken He went to town at 1.15 and I an hour later. I did a lot of errands and we came home at 3.30. I got the clothes ready and ironed after supper.